Posted on 20, September 2016 by EuropaWire PR Editors | This entry was posted in Education, Financial, Government, Healthcare, Investment, Science, United Kingdom and tagged cardiovascular, Jeremy Hunt, John Adler, lifestyle conditions, Loughborough University, Professor Mark Lewis, respiratory, UK's health research investment. Bookmark the permalink. Leicestershire, UK, 20-Sep-2016 — /EuropaWire/ — Loughborough University is to receive a slice of the UK’s largest ever investment into health research announced today by Health Secretary Jeremy Hunt. A regional consortium featuring Loughborough University and the University of Leicester, and led by University Hospitals of Leicester NHS Trust, will receive over £11m to establish a Biomedical Research Centre (BRC) focussing on cardiovascular, respiratory and lifestyle conditions.It is one of 20 NHS and University partnerships across England to receive part of a record £816 million in a five-year funding package (via the National Institute for Health Research) to develop new, ground-breaking treatments, diagnostics, prevention and care for patients in a wide range of diseases. “The UK has so often led the world in health research – from the invention of the smallpox vaccine to the discovery of penicillin and the development of DNA sequencing. Today, we are making sure the UK stays ahead of the game by laying the foundations for a new age of personalised medicine. 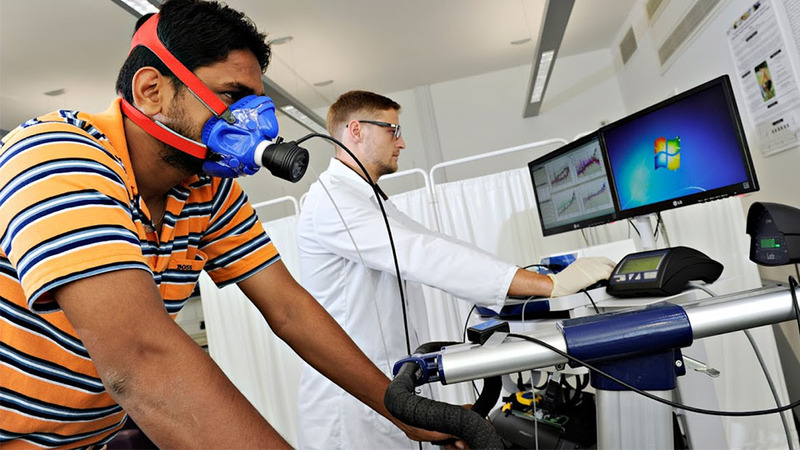 At Loughborough University, scientists will research how physical activity can help prevent and manage obesity, cardiovascular disease, chronic kidney disease and Type 2 diabetes. Researchers will trial a wide range of lifestyle interventions to determine the dose, frequency, intensity and duration of physical activity needed for the prevention and management of these conditions as well as elucidating the underlying mechanisms of action. “We know that exercise can reduce the risk of disease, but this funding enables us to dig down into the underpinning science behind why it works. Once we do that, convincing the public of the life-improving benefits of exercise becomes a much easier job. “We are delighted that we have been selected as one of the NIHR’s Biomedical Research Centres. This reflects our strong track record in research and our effectiveness in translating that research into clinical practice, particularly in the fields of cardiovascular, respiratory and lifestyle research. The BRC will develop the work of the existing Leicester-Loughborough Diet, Lifestyle and Physical Activity Biomedical Research Unit, a five-year partnership between Loughborough University, UHL NHS Trust, and the University of Leicester to drive innovation in the prevention, diagnosis and treatment of ill-health and translate advances in medical research into benefits for patents. It also furthers the aims of the National Centre for Sport and Exercise Medicine – East Midlands, a regional consortium of universities and NHS trusts tasked with improving the nation’s health and wellbeing through sport, exercise and physical activity.